Singer Ariana Grande celebrates her 21st birthday at Disney World in June 2014. There are a lot of ways to answer that question, but one simple gauge is to look at how much Americans are spending on their vacations. And lately, they have been spending a lot. Visits to Disney World and Las Vegas are up, according to the latest company reports, and people are eating and drinking more and purchasing more trinkets when they are at the resorts. Disney (DIS) theme park revenue was up 8% during the second quarter. The company credits "increased guest spending and higher attendance" for its good fortunes, especially at its American parks. It's notable that Disneyland Paris is struggling, but in the U.S., it's like economic magic. People are back -- even after Disney World raised prices in May. 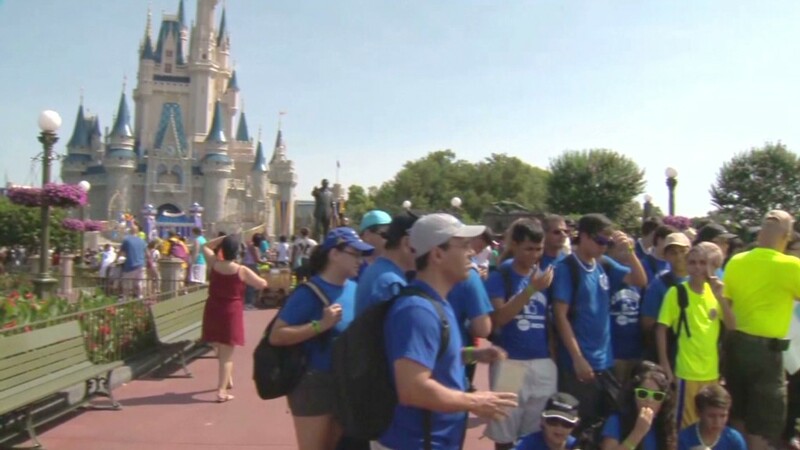 A day pass to Disney World in Florida now costs $96 for those over age 10. It's a similar story in Las Vegas. MGM (MGM), which runs Bellagio, MGM Grand and Mandalay Bay, among others, reported a surge in earnings this week that exceeded Wall Street expectations. Only a year ago the company was struggling, but now its hotels are almost full, and visitors are spending more. In short, the MGM house is winning big time -- casino revenue at its U.S. resorts is up 6% from the same period in 2013. To put it another way, the average daily rate for a night at the Bellagio was $259 on June 30, a nice jump from $247 a year before. Wynn (WYNN), which runs the Wynn Las Vegas and Encore resorts, saw its U.S. revenues jump 12.5%. Bookings are up, and Wynn has also benefited from more people losing money at its table games. The company isn't even seeing the usual summer slump. "We're pushing $50 million this month in Las Vegas," said Stephen Alan Wynn, CEO of Wynn Resorts when he was asked about corporate and conference activity during a late July call with investors. "I've never had a $50 million July in my business career in 40-odd years in gaming." The executives of each of these companies tried to play up the gains as great management and business strategy, but the economy is certainly helping. "That's the seventh quarter in a row that [margins] have been increasing year-over-year," said MGM Resorts International CEO James Murren. As CNNMoney has documented, plenty of Americans are still struggling, and the uptick in spending isn't being felt by all businesses. Six Flags (SIX), for example, saw a decline in attendance in 2014. Still, when America's popular playgrounds are doing well, it's a good indication that the middle class is feeling better.